And now to dgVoodoo 2.43! Now it's been updated to v2.42! But wait! There's more: nGlide 1.0.4. Hi guys, a quick update here about an old news: dgVoodoo has been updated to v2.41 last month. I didn't notice. However this is a very interesting update as it adds ddraw and d3d support to an already powerful tool! 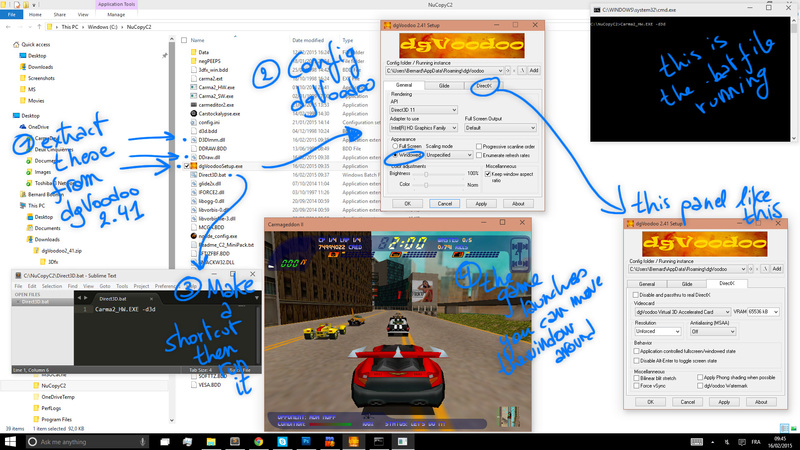 So you can run C1 in software mode with dgVoodoo's ddraw.dll too now! C2 in software mode starts but it crashed upon entering the race, maybe I just need to test again. However C2 now works well in D3D mode again! Nice news find there tosh! I was wondering though, c2 d3d has pretty much always worked for me. Is it commonly known it doesn't for many others? Oh here it's been years since I last had it working properly! Wow the d3d windowed mode works surprisingly well. I didn't get the regular error message on shutting down the game. I wonder if it will give us proper error messages now when we add modded content that has flaws. nGlide 1.0.4 changelog can be found in the first post link. -"4:3" aspect ratio option in nGlide configurator renamed to "Preserve original"
Nice, an Ultim@te Race Pro fix! The new versions of both dgVoodoo and nGlide are awesome! C2 3Dfx with dgVoodoo v2.5 in particular runs smoothly (and very good looking) on my Win7 x64 PC, which is a marvelous achievement by Dege. Even after following Tosh' instructions in the previous post, it still crashes. Dunno why. Any ideas how to fix this? Thanks. Well it still works here! But I have to make sure that dgVoodoo uses my Intel HD graphics as adapter (in the General tab) instead of my nVidia card or else it crashes! Added support for ‘d3dcompiler_47.dll’, so Win10 users don’t have to download and mess with d3dcompiler dll, 47 is part of the Win10 OS. Lower resource usage is partly included in this version. For the time being, only the usage of GPU accessible system memory. nGlide updated to version 2.0 with addition of a Vulkan API backend! This is great! If you encounter any problem with the new video backend, don't hesitate to share it on the official forum. Is there a dosbox compatible glide emulation that fixes the performance issues with alphas? I guess by 'alphas' you mean the voodoo patches. I think nGlide in DirectX9 mode works best with DOSBox (last time I tried I couldn't get dgVoodoo to work with DOSBox). DOSBox Daum doesn't like C1 too much apparently. On a decent machine, with GOG's DOSBox, nGlide 2 (D3D9), latest 3DFX patch (VOODO2C.EXE -vrush), making sure DOSBox is accelerated by the graphics card, and in case your on Win10 FCU that fullscreen optimisation is disabled for DOSBox (in the properties > compatiblity tab) then... you should expect 25-35fps ingame at 1920x1080. There's no miracle with DOSBox and the 3D-heavy games really.